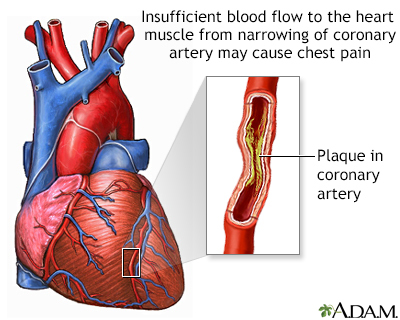 The spasm often occurs in coronary arteries that have not become hardened due to plaque buildup. However, it also can occur in arteries with plaque buildup. These spasms are due to a squeezing of muscles in the artery wall. They most often occur in just one area of the artery. The coronary artery may appear normal during testing, but it does not function normally. About 2% of people with angina (chest pain and pressure) have coronary artery spasm. Cocaine use and cigarette smoking can cause severe spasms of the arteries. This causes the heart to work harder. 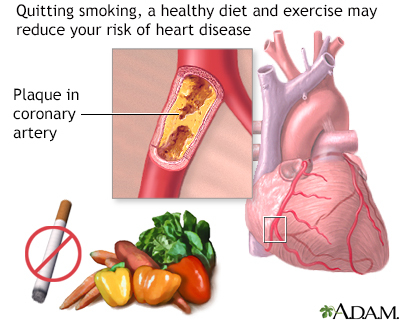 In many people, coronary artery spasm may occur without any other heart risk factors (such as smoking, diabetes, high blood pressure, and high cholesterol). Spasm may be "silent" (without symptoms) or it may result in chest pain or angina. If the spasm lasts long enough, it may even cause a heart attack. It is most often severe. The pain may spread to the neck, jaw, shoulder, or arm. May occur at the same time each day, usually between midnight and 8:00 a.m. The person may lose consciousness. Unlike angina that is caused by hardening of the coronary arteries, chest pain and shortness of breath due to coronary artery spasm are often not present when you walk or exercise. The goal of treatment is to control chest pain and prevent a heart attack. A medicine called nitroglycerin (NTG) can relieve an episode of pain. Your health care provider may prescribe other medicines to prevent chest pain. You may need a type of medicine called a calcium channel blocker or a long-acting nitrate long-term. Beta-blockers are another type of medicine that is used with other coronary artery problems. However, beta-blockers may make this problem worse. They should be used with care. If you have this condition, you should avoid coronary artery spasm triggers. These include exposure to cold, cocaine use, cigarette smoking, and high-stress situations. 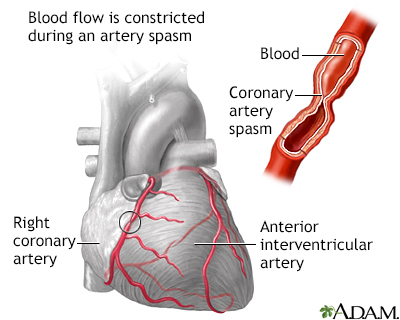 Coronary artery spasm is a long-term (chronic) condition. However, treatment most often helps control symptoms. The disorder may be a sign that you have a high risk for heart attack or deadly irregular heart rhythms. The outlook is most often good if you follow your treatment, your provider’s advice, and avoid certain triggers. Immediately call your local emergency number (such as 911) or go to the hospital emergency room if you have a history of angina and the crushing or squeezing chest pain is not relieved by nitroglycerin. The pain may be due to a heart attack. Rest and nitroglycerin often do not completely relieve the pain of a heart attack. A heart attack is a medical emergency. If you have symptoms of a heart attack, seek medical help right away. Take steps to reduce your risk of heart disease. This includes not smoking, eating a low-fat diet, and increasing exercise. Amsterdam EA, Wenger NK, Brindis RG, et al. 2014 AHA/ACC guideline for the management of patients with non–ST-elevation acute coronary syndromes: executive summary: a report of the American College of Cardiology/American Heart Association Task Force on practice guidelines. Circulation. 2014;130(25):2354-2394. PMID: 25249586 www.ncbi.nlm.nih.gov/pubmed/25249586. Giugliano RP, Cannon CP, Braunwald E. Non-ST elevation acute coronary syndromes. In: Mann DL, Zipes DP, Libby P, Bonow RO, Braunwald E, eds. Braunwald’s Heart Disease: A Textbook of Cardiovascular Medicine. 10th ed. Philadelphia, PA: Elsevier Saunders; 2015:chap 53.